Kitchen robot Sencor STM 3010WH is a modern and useful helper in any kitchen. 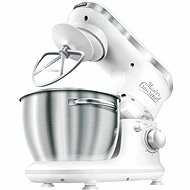 This great robot has a unique planetary motion system, where the mixing hooks effectively rotate along the bowl, ensuring optimal mixing of all ingredients throughout the bowl and enabling 100% of ingredients being processed. Multifunctional robot can knead, mix and whip. Among its practical accessories, there is a kneading hook for heavy and stiff dough with yeast, a mixing A-shaped whisk, a balloon whisk and a whisk for making the perfect snow, and cream. The bayonet mounting system of attachments will facilitate and speed up the mounting and exchange of the tools. All attachments have a special collar, which protects the gearbox from any debris. 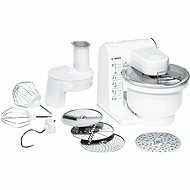 To prepare the ingredients, the device is equipped with a 4 litre stainless steel bowl, allowing you to seamlessly prepare up to 1.6 kg of dough with 8 egg whites. The device has 6 speeds with a maximum power of 450 watts. The unique pulse mode provides of up to 172 revolutions per minute. This professional robot is equipped with a safety protection against overheating and non-slip stand for improved stability. All stainless steel attachments and parts can be easily washed in the dishwasher. You'll appreciate the sleek design in the stylish pink colour. Simplify your work and get the necessary time in the kitchen. Be creative with this professional planetary robot. 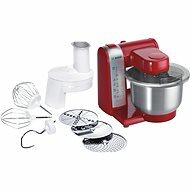 The preparation of larger volumes of dough, creams, whipped creams, foams etc. stainless steel and plastic Done! mixing whisk, kneading hook, balloon whisk Done! For shipping to other EU countries visit this page Sencor STM 3018RS pink. Chcete doručit zboží do Česka? Prohlédněte si SENCOR STM 3018RS růžový. Chcete doručiť tovar na Slovensko? Prezrite si Sencor STM 3018RS ružový. Magyarországra történő kiszállításért tekintse meg ezt a termékoldalt: Sencor STM 3018RS rózsaszín.